In spite of geopolitical tensions, trade conflicts and international debt, 65.9 percent of the respondents still regard conditions as positive. 30 percent believe at least that their companies can absorb a slowdown in economic activity. 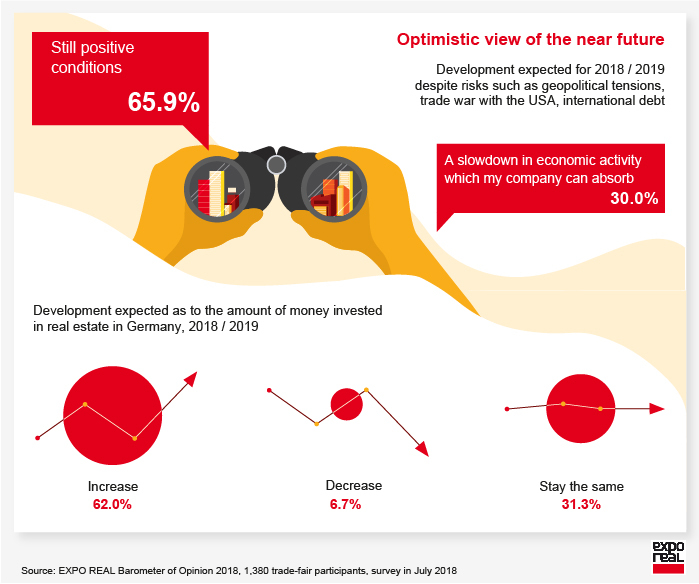 62 percent think that the amount of money invested in real estate in Germany will increase, 31.3 percent that it will stay the same. The federal structure in Germany offers many locations with potential beyond the big metropolises. The top ‘B’ location by far is Leipzig (48.1 percent) followed by Nuremberg (33.6 percent), Wiesbaden (29.7 percent), Münster (28.7 percent) and Hanover (26.3 percent). In the opinion of the respondents, residential properties (88.5 percent) will continue to gain in importance. In particular, public housing/subsidized living is the trend here because 42.9 percent take the view that this segment will be of increased importance. 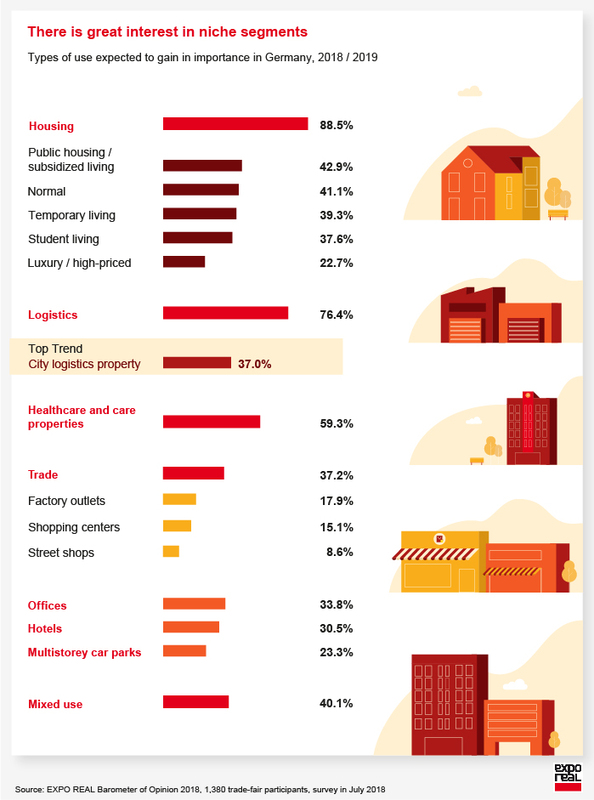 Logistics is the second area of high potential, the top subcategory here is city logistics properties with an affirmation level of 37 percent. Healthcare and care properties are the number three area with high potential in the segments. So aside from classical investment properties like offices and retail, it is niche segments which meet with the greatest interest among real estate experts. How should the state promote affordable living? 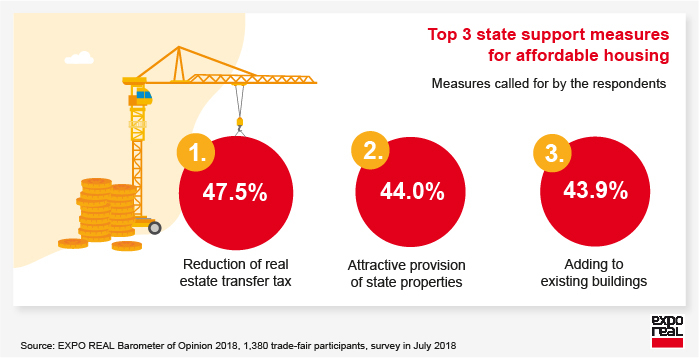 Most of all, the respondents prefer a reduction of real estate transfer tax (47.5 percent), attractive provision of state properties (44 percent) and adding to existing buildings (43.9 percent). Far behind is state regulation of rents—with an affirmation level of 13.2 percent. In the middle are state housing (38.8 percent), state promotion of private homes (33.6 percent) and a stronger concentration (30.4 percent). 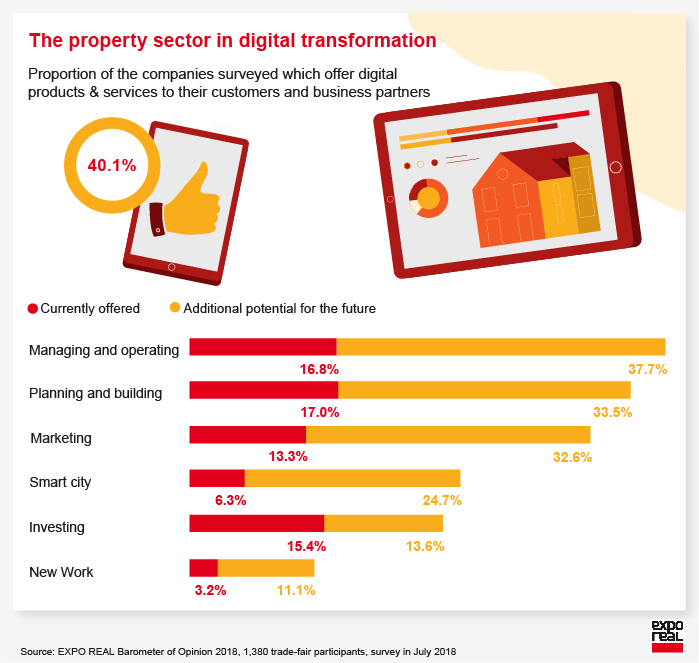 40.1 percent of the respondents indicate that their companies offer customers and business partners digital products and services. These are currently offered along the entire value chain. Most of all, great potential for the future is seen in the areas of ‘Managing and operating’, ‘Planning and building’ and ‘Marketing’. ‘Smart city’ is the area with the biggest gap between what’s currently offered and additional potential, so that’s where the biggest development leap is to be expected for the future.